This blog post is meant as a quick introduction to what I think are the key take-aways of Pester and how I use it. So why on earth should you test your PowerShell scripts, are they not meant to be ad-hoc? I do believe, much like in any other language, that sometimes you don’t have the need to test your code (say what!?). Sometimes it definitely a place for ad-hoc code that just just executes once or twice just to accomplish something for the time being. However when you’re constructing something that will survive over time and that others may use and improve, testing is extremely useful. Don’t let the word “script” or “shell” fool you, it’s still code. PowerShell is often used in some sort of configuration scenario, may it be in a build/setup scenario for SharePoint or a deployment framework for your web application etc. It often deals a lot with external dependencies such as services and IO which are often hard to get under test. Or is it? Disclaimer: I’m a BDD enthusiast and specifically I ‘m very fond of Specification by Example and the Gherkin syntax. This may (ok, it will) influence how I use the Pester framework which is really more leaning towards RSpec than Cucumber or SpecFlow (both being Gherkin family frameworks). Note: All the code for this post can be found here. please note: StringCalculator.ps1, which has the Add function, reside in the same directory as the tests. (Line 1-3 dot sources that file into the test). We’ll go trough all the different parts of a pester test shortly but for now you should know that Describe-Context-It-Should-Be are Pester keywords/concepts. (in PowerShell terms, they are functions). Pester will, out of the box, locate files named *.tests.ps1 in the current directory and downwards. (Therefore I’m setting the current location to where my tests reside with Set-Location). Next, we’ll need to import the pester module (that may be optional if it has been added globally already as we’ll see examples of shortly). Finally, kick it off with a call to Invoke-Pester. So now that we’ve seen a simple example on how to use Pester we now need to find out how to get it onto our machine. A few different options exist depending on the context one might say. You always have the option to go to github and grab the bits and copy them (or fork/clone) to your machine. The problem here is versioning. I mean…it’s not something compiled we’re getting it’s just a text file. 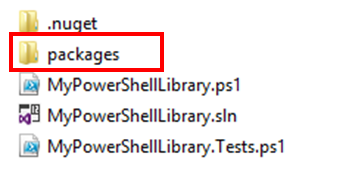 After you’ve installed the Pester NuGet package (Install-Package Pester) you’ll get a ‘packages’ folder that contains the Pester files. Known technology to many .NET developers and has a versioning story. You get the Pester code close to your own code and you know the version it has. You may need a solution file or something that NuGet can understand (packages.config) just for the sake of using NuGet. I’ll try to come back to the Pester/NuGet story in a future post perhaps when I aim to speak about TeamCity and Pester. If your scripts reside in the same folder as the ‘packages’ folder (as the image above shows) here’s what can happen when you execute Pester. See…it starts running the Pester test. That’s because Pester runs files names *.tests.ps1 in the current folder and all child folder. Pester itself is a child folder (the NuGet package includes all the tests as well). I’ve moved my scripts (and tests) into a subfolder (‘src’) and when I call Pester I make use of the relative path parameter to point it to start in that folder. Another alternative is to get the Pester bits onto your machine once, a.k.a. global install. Here you can use Chocolatey or PsGet. I’m showing you the PsGet approach simply because I didn’t get it working with Chocolatey actually. Install once (handle updates once). Hard to handle versions on the entire system like this perhaps. OK, now let’s go into more details on some Pester things that might be good to know about. Instead of a test case class, Pester (BDD) uses a “describe” block for one test case. Describe is a function that takes two parameters: a string and a script block. The string is a name or title for a spec suite – usually what is under test. My style of writing tests in PowerShell is more towards function per function so describe for me is the name of the function that I’m putting under test. In a regular unit test this would probably have been my test class (fixture). Context is just an alias for describe. It is used to organize test code into different contexts. I like to think of this as my ‘Given’-clause where I’d like to setup my preconditions. Or in AAA terms this is the ‘Arrange’ part . Remember, this is your DSL so it’s very important that you feel comfortable with it and it makes sense to you. Each test method is an “it” block. This would be the ‘act’ part. 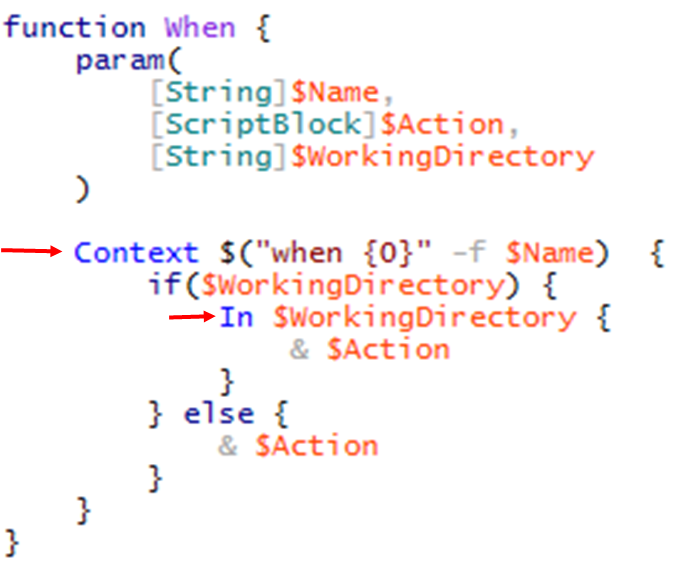 I often place my ‘act’ in the context part of the code as apart from the It-block. This is just because of how Pester treats expectations and I might want to do multiple expectations on the same context. BDD style assertions are called expectations. Should is just a syntactic sugar that makes it more readable. Pester has a lot of very useful (readable) should expectations. I like to think of this as my ‘Then-clause where I check my post conditions. Or in AAA terms this is the Assert part . Therefore I’m often writing it like “then [some condition]”. Again, the DSL is important. Since describe, context and it blocks are functions, they can contain any executable code necessary to implement the test. PowerShell scoping rules apply, so variables declared in a describe are available to any descendant block inside the suite. This section will focus more on some personal “best practices” that I have found useful when working with Pester. If we want to put that function under test to verify that it indeed writes an error when the result.txt file is missing, how do we do that? First, we’ll need to make sure we can add and remove the file as we please. Pester has something called a TestDrive which is a temporary folder that the test has access to. Let’s see it in action. Start with a failing test… (the TDD purist would probably scream now and say that you can’t write code before you have a failing test…well I just did so). Indeed it fails and it fails because I couldn’t seem to figure out how to add the file (or setup my precondition so to say). 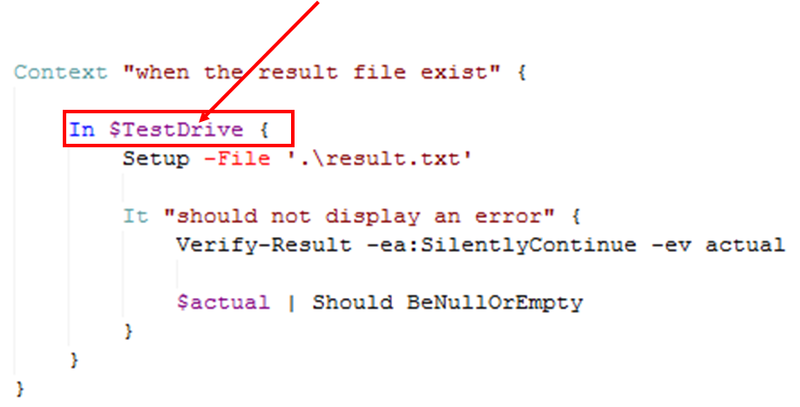 Setup let’s us add file or folder to a temporary location that only exist throughout our test…then it is deleted. Indeed the file is added but the test still fails. That’s because we’re not executing the that location, pretty common scenario…the working directory issue. We’ll use another Pester thing…the In-construct to help us solve that issue. I’ve wrapped the whole ‘interacting with file system’ part in a call to the In function that takes a path and a script block. The path is taken from the pester global variable $TestDrive. The code is now executed with that temp folder and happy day! Now we can refactor, right? Here we have the opportunity for some refactoring. As I see it the test code is now a bit ‘cluttered’ with that call to in. What if I should make something that can combine a call to context and combine it with the in call. What if our code could look like that instead. In my world that would be better. Change ‘describe’ to ‘fixture’ instead. Change ‘context’ to ‘when’ and add a parameter to it, WorkingDirectory, that allow us to set the working folder for the entire when function. Fixture just wraps the call to describe and adds some text around the call. When wraps the call to context, with a prepended ‘when’, and optionally executes the code in the in-clause if you provide a working directory. Yes it can be done. Great examples already exist at the Pester wiki. Note: All the code can be found here. This entry was posted on September 13, 2013, 19:11 and is filed under PowerShell. You can follow any responses to this entry through RSS 2.0. You can leave a response, or trackback from your own site. Super handy intro to Pester.